Bloomsbury USA Childrens, 9781619636170, 240pp. The first book in E. D. Baker's beloved Frog Princess series -- the inspiration for Disney's hit movie The Princess and the Frog! Princess Emeralda a.k.a. Emma isn't exactly an ideal princess. Her laugh is more like a donkey's bray than tinkling bells, she trips over her own feet and she does not like Prince Jorge, whom her mother hopes she will marry. But if Emma ever thought to escape her troubles, she never expected it to happen by turning into a frog! When convinced to kiss a frog so he might return to being a prince, somehow the spell is reversed and Emma turns into a frog herself! Thus begins their adventure-a quest to return to human form. Fascinating and hilarious characters ranging from a self-conscious but friendly bat to a surprisingly loyal snake and a wise green witch confirm that readers won't soon forget this madcap story. 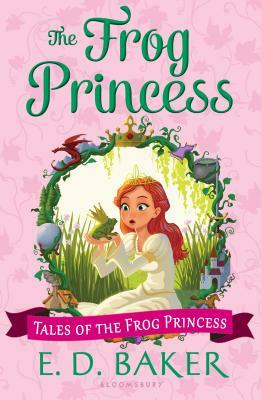 E. D. Baker is the author of nine books in the Frog Princess series, including The Frog Princess (the inspiration for Disney's hit movie The Princess and the Frog! ), Dragon's Breath, Once Upon A Curse, No Place for Magic, The Salamander Spell, The Dragon Princess, Dragon Kiss, A Prince Among Frogs, and The Frog Princess Returns, as well as the Tales of the Frog Princess series, the Tales of the Wide-Awake Princess series, the Fairy-Tale Matchmaker series, the Magic Animal Rescue series, the More Than a Princess series, and other delightful books for young readers including Fairy Wings, Fairy Lies, and A Question of Magic. She lives with her family and their many animals in Maryland.